The state of Arizona has been cutting taxes every year for more than 25 years in an attempt to spur economic development. So far trickle down economics hasn’t worked well. 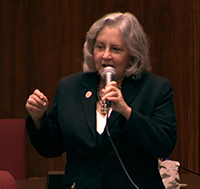 Rep. Pamela Powers Hannley introduced HB2532 to establish a feasibility study to collect baseline data regarding the benefits of establishing an Arizona state bank. Powers Hannley and her husband Jim are co-directors of Arizonans for a New Economy. In an Arizona Capitol Times profile, Powers Hannley talked about using public baning to spur Arizona’s economy, instead of corporate tax breaks. ACT: You’re big on public banking. That’s an interesting issue because it’s something that the conservative right and the progressive left agree on. I was surprised how many times I voted with Eddie Farnsworth this year. There were many times where, I guess you would call them the Libertarians, the very fiscally conservative Republicans, and the progressive Democrats voted together and we stopped a lot of stuff. Several of those (are) what I would call giveaway bills. So, my point with the public banking is, rather than giving the money away, why don’t we offer a low-cost loan program? The state needs revenue. Rather than just giving away millions into the future, why not help smaller businesses? Right now, our economic policies are benefitting the big corporations, not the mom and pop businesses, and as a Democrat, I ran as a small business person. I had two small businesses. My husband has a small business. Our policies are doing nothing to help small business, and that’s where public banking could help. And a lot of those rural counties could really benefit from something like that, rather than spending millions on Intel [referring to a large corporate welfare bill passed on the Legislature’s last day]. That’s just going to help Chandler. It’s not going to help the rest of us. What’s next for Arizona? Stay tuned. Cross-posted from the Public Banking Institute Blog. Keep up-to-date with Public Banking Institute News by subscribing to their newsletter here. What if People Owned the Banks?